Early March 2015, the Happy Sky safely completed the transportation of LQP Bridge and Flare Bridge for the Marfumeira Project. 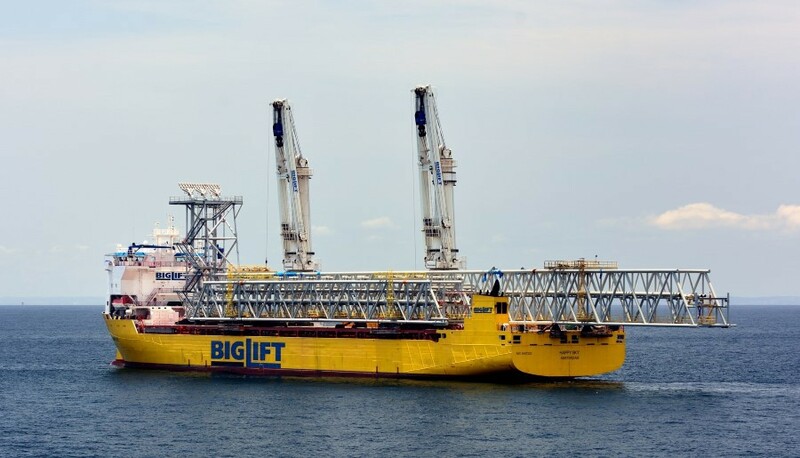 BigLift had been awarded the contract on the basis of good cooperation with Heerema Marine Contractors in other projects and on the suitability of the vessel and her crane capabilities. BigLift has been working with Heerema on previous projects and is familiar with the requirements and culture of Heerema Marine contractors, which all contribute to preparing and executing the project on time and within budget. Happy Sky loaded an 80 m long living quarter bridge (LQP) and a flare bridge (FLR) of 160 m, with a weight of 780 metric tons at the DSSC wharf in Yantai, China. In the stowage position the cargo overhang at the stern was more than 36 m. HMC’s Thialf and Hermod lifted the LQP Bridge and the Flare Bridge directly off Happy Sky’s deck and installed the structures on to the living quarters and the processing platforms.